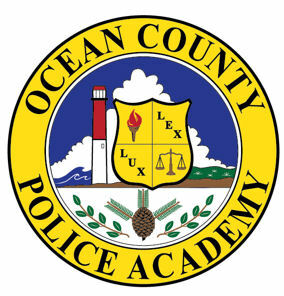 The Ocean County Police Academy is a premier law enforcement training academy located in central New Jersey. It is one of 15 law enforcement training academies certified by the New Jersey Police Training Commission. Each year, the academy trains more than 300 recruits in various law enforcement disciplines such as Basic Police Officer, Special Police Officer, County Correction Officer and Humane Law Enforcement Officer. In addition to basic recruit training, the Academy is also host to in-service and specialized law enforcement training programs for newly certified and veteran officers. 1. The Latin phrase “Lux-Lex” with Lamp and Scales represents the Academy’s motto “Law and Light; Knowledge and Justice” this is the spirit of our Police Training. 2. The Blue Field—stands for Justice. 3. The Laurel Leaf—since early civilization indicates Academic Honors, Distinction and Fame. 4. The Pinecone with Pine Branches—infers Strength and Growth. 5. Lighthouse with sea shore scene—traditional symbol for Ocean County. The Entire symbolic meaning embodied in the Ocean County Police Academy Seal reflects Academic Achievement, Strength, Valor, and Integrity. *Original concept from Director James Tracey, 1975-1992, and drawn by Joyce DeMayo.